When custody disputes arise, I often consider the Biblical narrative, 1 Kings 3:16-28, which tells the story of how King Solomon resolved a custody dispute of sorts between two women who lived in the same home. The women came before King Solomon, each claiming to be the mother of the same baby boy. King Solomon called for a sword and rendered his judgment: He would cut the baby in two so that each woman could receive half. The first woman did not contest Solomon’s decision, arguing that if she could not have the baby, then neither woman could. The second woman begged King Solomon to give the baby to the other woman instead of killing the baby. King Solomon declared the second woman as the infant’s true mother, reasoning that as a mother she would give up the baby if she had to in order to save his life. In custody cases, I often see people come in with some preconceived notion about how they think family court judges handle custody cases. Some, for instance, are of the false believe that mothers are presumed to have primary custody of children and that they come in “ahead” somehow in a custody dispute. That is not the case. They also believe that it is presumed that fathers are going to then have limited time with the children. Neither is the case. New Jersey’s custody statute, N.J.S.A. 9:2-4, states the Legislature’s policy is to “assure minor children of frequent and continuing contact with both parents after the parents have separated or dissolved their marriage and that it is in the public interest to encourage parents to share the rights and responsibilities of child rearing in order to effect this policy”. The statue also states that “In any proceeding involving the custody of a minor child, the rights of both parents shall be equal . . .”. Some litigants when they come in think that there is a presumption that the children will be “split in half” so to speak – as King Solomon suggested, and that this is done by splitting the time with the children in half, like splitting a bank account. There is no such presumption in New Jersey of 50/50 parenting time. Equal parenting time is an option for the family court under the existin custody, statute but it is not presumed. Rather, the standard for New Jersey in determining custody and parenting time is the gender neutral “best interest of the child” standard. This gender neutral standard has been described by our state’s Supreme Court as one that protects the “safety, happiness, physical, mental and moral welfare of the child.” Fantony v. Fantony, 21 N.J. 525, 536 (1956) . To assist and guide the family courts in determining what custody and parenting time arrangement is in the “best interest” of the child(ren), the statute requires the courts to “consider but not be limited to the following factors: the parents’ ability to agree, communicate and cooperate in matters relating to the child; the parents’ willingness to accept custody and any history of unwillingness to allow parenting time not based on substantiated abuse; the interaction and relationship of the child with its parents and siblings; the history of domestic violence, if any; the safety of the child and the safety of either parent from physical abuse by the other parent; the preference of the child when of sufficient age and capacity to reason so as to form an intelligent decision; the needs of the child; the stability of the home environment offered; the quality and continuity of the child’s education; the fitness of the parents; the geographical proximity of the parents’ homes; the extent and quality of the time spent with the child prior to or subsequent to the separation; the parents’ employment responsibilities; and the age and number of the children. A parent shall not be deemed unfit unless the parents’ conduct has a substantial adverse effect on the child.” This gives the family court’s discretion to assess the individual circumstances of each case and, rather than treat all cases the same, create a decision that suits the needs of the particular child(ren) at issue and to try to create a custody and parenting time arrangement that is best for the child(ren) in that case. The court is required to make findings of fact and conclusions of law, and our higher courts may review those decisions for abuse of that discretion or any legal error. Today, the Washington Post is reporting that “More Than 20 States in 2017 Considered Laws to Promote Shared Custody of Children After Divorce“. This article points out that more couples parent collaboratively and that state lawmakers may be deciding to accelerate co-parenting trends by creating a legal presumption in favor of joint physical custody wherein children spend equal or close to equal amount of time living with each parent. New Jersey is one of those states in which this is being considered. In November, 2017 two identical bills (A5189 and S3479) were introduced in the New Jersey Legislature that would change how custody is determined in New Jersey so that the courts would be required to presume that custody and parenting time would be equally divided 50/50 or close to 50/50 between divorcing parents – even if the parents do not agree. 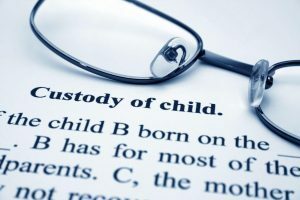 The new statute would state that “The court shall presume that an award of joint legal and physical custody is in the best interests of the child” and that in any proceeding involving custody of a minor child, the rights of both parents are not only equal but “there shall be a rebuttable presumption of joint legal custody and equal or approximately equal physical custody”. The order for the court to enter for joint legal and physical custody of the child would include “(1) provisions for residential arrangements so that a child shall reside an equal or approximately equal amount of time with each parent in accordance with the needs of the child and the parents; and (2) provisions for consultation between the parents in making major decisions regarding the child’s health, education, and general welfare”. A parent desiring an alternative custodial relationship would have the burden to rebut this presumption of joint physical custody. The parent doing so must do more than show that 50/50 joint physical custody is not in the child’s best interest. Rather, the proposed new statute provides that “To rebut the presumption of equal or approximately equal physical custody, a parent shall bear the burden of proof and must provide clear and convincing evidence that joint physical custody is harmful to the child.” (emphasis added) Only if the presumption is rebutted may a court then award primary physical custody to one parent, or sole custody to one parent with appropriate parenting time to the noncustodial parent, or any other custody arrangement determined by the court to be in the best interest of the child. This proposed amendment to the state’s custody statute would be an enormous difference to the current custody statute. What are the supposed benefits of such a change in the law? One benefit is less litigation over custody and parenting time. Most cases in New Jersey settle, meaning that most custody and parenting time arrangements are settled by the parties themselves and not the court. Custody litigation can be emotionally and financially painful, and can increase hostility and lack of cooperation between parents given that one parent may feel the winner and the other parent the loser. Another benefit is that it is assured that the children do have a great deal of time with both parents, and assured meaningful time with both parents is one of the policy goals of the Legislature, as even stated in the existing statute. The proposed statute would prevent any inherent biases of the judges. As pointed out in the Washington Post article, fathers groups have been advocating for the creation of the presumption of joint 50/50 parenting time arrangements because they perceive judges to have biases in favor of mothers, and they feel that without such a presumption in favor of 50/50 parenting time, fathers’ ability to co-parent is hampered, and parental alienation is encouraged. Not all states have been accepting these proposed statutory amendments to presume a 50/50 shared physical custody arrangement. One drawback is depriving the family court judges of discretion to create a custody and parenting time arrangement that considers the facts and circumstances of each case and the ability to tailor a custody and parenting time arrangement that serves the specific needs and best interests of the children at issue before them. The proposed statutory amendment is certainly cynical about the roles and abilities of judges to assess facts of the cases before them and render them objectively. Under the existing statute, judges are able to award a 50/50 custody and parenting time arrangement where it is in the best interest of the children in the facts of that case. There is no presumption of any particular custody arrangement. Additionally, the proposed statutory amendment may expose children to more upheaval and instability. Not all children are raised in a household where parents parent equally. In many households, one parent is a primary care giver and the other a secondary care giver. Imposing a 50/50 custody and parenting time arrangements and ignoring historical roles and relationships between parents and children may add upheaval and disruption to the lives of such children. In Beck v. Beck, 86 N.J. 480 (1981) , the Supreme Court of New Jersey recognized some of the concerns about joint custody, noting: “The objections most frequently voiced include contentions that such an arrangement creates instability for children, causes loyalty conflicts, makes maintaining parental authority difficult, and aggravates the already stressful divorce situation by requiring interaction between hostile ex-spouses.” Id. at 487. In cases where parents co-parented equally and collaboratively prior to their separation, they are probably going to be inclined to reach their own agreement on continuing those arrangements, even in the face of discord over the end of the marriage. It is the cases where parents do not agree, which are in the majority, where the court even has to render a decision. Imposing a 50/50 parenting time arrangement on parents who do not agree, and who may have a good relationship with one another, may only create a lifetime of disagreement, chaos, and tension for the children. A 50/50 parenting time arrangement generally requires parents who communicate well and can reach agreements. Not all parents can. Amendments such as the one being proposed in New Jersey removes protections against abusive or controlling former spouses or paramours. Moreover, looking back to the case of King Solomon and cutting the proverbial baby in half, one could easily see a situation wherein a parent who was a primary care giver to a child would make financial concessions in a divorce settlement in terms of support and/or the equitable distribution of assets that he/she would not otherwise have done, in order to maintain the ability to provide primary care to a child and avoid having a 50/50 parenting time arrangement imposed on him/her by the court. Such a child would suffer financially as well. If the custodial parent were the mother, the children’s poverty would be worsened. Already, divorced women are three times more likely to live in poverty than divorced men. A manipulative or controlling spouse could do damage with this proposed amendment to the custody statute. It should be made clear that this is only a PROPOSED amendment to the New Jersey custody statute. It is not the law and it is not known if it will become the law. The fact that this proposed amendment, along with such proposals in nearly half of states that were considered in the past year does, however, warrant consideration and discussion of the benefits and detriments of creating presumptions in terms of custody and parenting time arrangements.